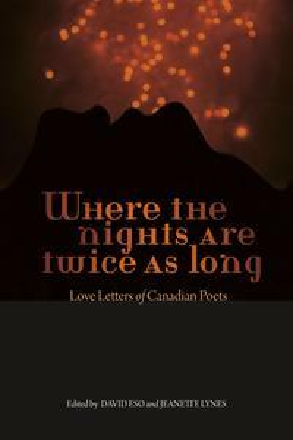 Under the covers of Where the Nights Are Twice as Long: Love Letters of Canadian Poets, David Eso and Jeanette Lynes collect letters and epistolary poems from more than 120 Canadian poets, including Pauline Johnson, Malcolm Lowry, Louis Riel, Alden Nowlan, Anne Szumigalski , Leonard Cohen, John Barton, and Di Brandt, and many others, encompassing the breadth of this country's English literary history. We are pleased to feature this excerpt, a love letter from P.K. Page to F.R. Scott, a letter full of longing and love from one poet to another. And learn more about the anthology at http://wherethenights.tumblr.com. I’m sorry to write rot. 1x1 has just arrived. Lambie-pie how swell of you. I have been gobbling it up & not understanding but getting the feeling & going back & regobbling & understanding better & all in all feeling it’s my birth day or yours or something. Cummings seems to be a sort of carrier pigeon flying back & forth between us. I have decided to leave here on the 14th & that is definite. Will arrive at New River the same day — or night rather — if I can connect with a bus. I’m quite excited about it. From now on I’m going to try to work like stink on the histories to make enough money to coast for the rest of the summer. Have made 45 bucks to date without much effort. All I need to see me for the entire summer is about $200 so it ought to be easy. God how nice it is not to be at an office! It would be wonderful if work was bringing you East instead of taking you West. Do you think you look a little like mr. e.e. cummings because I do. He’s a sort of rougher-tougher version. Today I have cocktail party which fills me with cold dread. I deserve it — shouldn’t get in these situations. I shall drink 2 drinks if I get chance & leave. One for you & one for me & the departure for us both. Mr. Galloway is a very unpolitical young man who believes in ART. He tells me my ideas are very young. He says individuals are what matter & I agree with him, but he can’t see how its possible for me to agree on that point & still contend that a social awareness is vital. He has a sense of intellectual superiority which almost completely isolates him. He refuses to allow that anyone who can not appreciate Beethoven is worth keeping alive. We drive rapiers into each other but neither winces — neither is convinced. It’s easy to see what has made him as he is & he’s at least honest about it. e.e. cummings’ name on the book is almost a reverse of your signature inside. In fact there are a lot of strange things about that book! This, at this sitting won’t be much more than a goodnight. Today I had mail from Hermes & Bruce, both of whom gave me little tiny bits of news about you, which made their letters more important than they knew. I have just walked miles around the Park & I really mean miles. The sea smelled of the sea & the pines of the pines & now I am weary. But weary or no I could do with the good solid reality of you — your sweetness & your funny remoteness which was sometimes almost an agonizing inaccessibility & such a terrific contrast to the other you which was, as I think I told you once, only comparable to being enclosed in a swarm of warm, live almost imaginary birds — imaginary, because super-birds — & completely protected by them. Magnify that feeling & then you are the seraph I told you of. How silly this all sounds & how inadequate. Nowhere near as adequate in fact as the letters on fences spelling MARY LOVES ERIC. Letter from P.K. Page to F.R. Scott was published in Where the Nights Are Twice as Long: Love Letters of Canadian Poets, edited by David Eso and Jeanette Lynes. Reproduced by permission of Goose Lane Editions.